Most of us have been there before. We’re driving along happily, when suddenly, a rock jumps up and chips our windshield. At first, we get angry, but it’s not long before we start ignoring it like it’s an overdue speeding ticket. But just like when we put off paying speeding tickets, things only get worse (and more expensive) for us when we delay fixing windshield cracks. The chip on your windshield may not bug you right now, but at any moment, it can spiderweb into something larger and more serious. Below, we’ll explain why driving with a cracked windshield is unsafe, and why you shouldn’t wait to get yours fixed. First of all, a cracked windshield can obstruct your field of vision when you’re driving. And you don’t need to be a genius to understand that anything obstructing your vision is a distraction. A clear, intact windshield can be the difference between you noticing or not noticing the deer darting across the highway. Why risk the dangerous and potentially fatal consequences that could come from a cracked windshield impeding your vision? The cost of a new windshield is nothing compared to the cost an accident could incur. In addition to the cost of replacement, ignoring a chipped windshield can land you an expensive traffic citation. 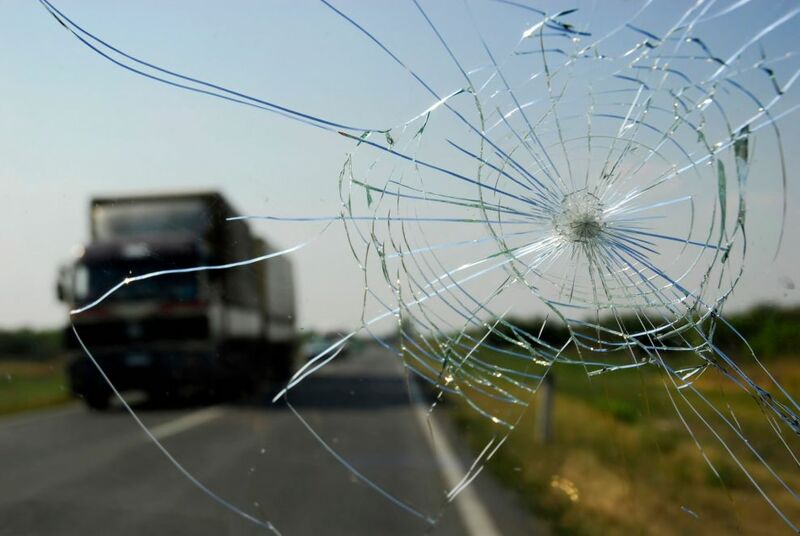 That’s right – a cracked windshield is considered a road violation in most Canadian provinces. If you’re caught driving with a badly cracked windshield, police could issue you a ticket, an order to repair by a certain date, or even an order to remove your vehicle from the road. For instance, in Alberta, drivers can be fined for cracks or blemishes on their windshield exceeding 12mm in diameter. In some cases, the fine can range into the hundreds of dollars! Moreover, in British Columbia, the fine is $56, while in Ontario, it’s $110. This excuse won’t fly if you have a cracked windshield, no matter how bad you have to go. When your car suffers a collision, your airbags deploy to cushion the impact and help prevent whiplash and other injuries. As your airbags deploy, they expand against your windshield and direct themselves towards you and the passenger. However, a cracked windshield may not be able to support the force of an inflating airbag. In such a case, the windshield may break, allowing the airbags the room to expand outside the car. If that were to happen to you, you’d have neither the windshield nor the airbags working to keep you safe. So, by neglecting to fix your windshield, you risk severe injury, and even death. I’m no doctor, but I’m willing to bet your chances of survival in a collision are much better if you aren’t thrown from your vehicle. For safety reasons, windshields are much more prone to crack if pushed from the inside than from the outside. If you’re ever trapped in your car and have no way out, you can kick out the windshield. Most will go with two to four good, solid boots. What’s more, a windshield will break from the inside much easier if there’s already a crack in it. If you press your thumb against a chip in your windshield from inside your car, you’ll see it spread rapidly. Now, imagine that instead of your thumb, it was your entire body throwing itself against the crack. Starting to get the picture? A damaged windshield reduces your car’s structural integrity. The roof, in particular, is left much weaker by a pesky crack. In lots of cars, the windshield acts as a sort of support beam for your roof. In the event of a rollover accident, it aids in supporting the roof and keeping it intact. However, if there’s a crack in the windshield, it may not have the strength to perform this function. The roof could collapse under the weight of the car, which could have serious – even fatal – consequences. While your windshield’s chip may not look like much now, it won’t take long to grow into something much larger. When that happens, you’ll have to get your entire windshield replaced, costing you your hard-earned money. When treated early, rock chips are easy and cheap to have repaired. Rock chip repair essentially works by vacuuming out the air, since rock chips are basically just that – air. When a rock hits your windshield, it creates an air pocket that separates the glass. So, after the mechanics vacuum out the air, inject some resin, and cure it with a UV light, your windshield is pretty much good as new. As long as the chip is under the size of a loonie, the problem can usually be fixed this way. It should only cost about $20 to have done. Another reason to get small rock chips fixed early is that if you don’t, your windshield will become discoloured. Wiper blades and weather force dirt and debris into rock chips, and windshield washer fluid contains dye. So, if you wait a few weeks to get it fixed, your windshield will likely be discoloured and look dirty. It’s best not to wait more than a few days after noticing a rock chip to book a service appointment. In sum, ignoring a cracked windshield will cost you money, increase the risk of injury for you and your passengers, and can land you a pricey citation. That’s why you shouldn’t wait to book a service appointment when you notice a chip in your windshield. If you service with Go Auto, you’ll get a free loaner vehicle, the chance to save 10% on your bill with your Go Card, and the option to postpone your payments for up to six months. With perks like these, there’s no better place to get your damaged windshield repaired. Booking a service appointment is easier than ever, just text or call 1-780-777-7777, or click here to do it online.